Every year, in Taiji, Japan, dolphins are chased into a small cove and butchered in the most horrific and cruel way.In 2004, IMMP (International Marine Mammal Project) started Save Japan Dolphins campaign. In 2009, ‘The Cove’ Academy Award-winning documentary, depicts Earth Island Institute’s campaign in Taiji to stop the dolphin hunts. The Taiji dolphin slaughter continues. Dolphins are one of the most intelligent and social animals. In 2013, india has officially recognised dolphins as ‘non-human persons’ and banned keeping them in captivity for entertainment. When I heard and found out about ‘The cove’ I was horrified and didn’t want to believe it. I had been making endangered species, and though the species that have been hunted are not endangered, I felt I had to make them someway. I had to broaden my theme to equality and tolerance. I was to have my first solo exhibition in Japan, and thought it was a fitting theme. I remember when I was at school, whale meat was on school menu. It was commonly eaten. Whale meat is still on some of restaurants’ menu, though not many, it is not illegal or condemned. Now the number of people eating dolphin/whale meat has dropped, I heard that most of the meat becomes pet food. The meat is laden with mercury and PCBs. 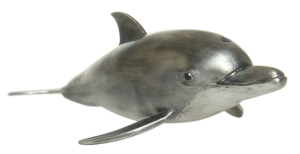 I made five species of dolphins, which are Hector’s/Maui’s, Striped, Bottlenose, Risso’s and Short-finned Pilot Whale. The smallest dolphins, Hector’s /Mau’s dolphins (they look identical) are endangered/ critically endangered respectively. They only live inshore waters of New Zealand and have serious problems with entanglement in fishing gear. Some of the inshore areas are closed to gill netting but New Zealand government have been accused of not doing enough. 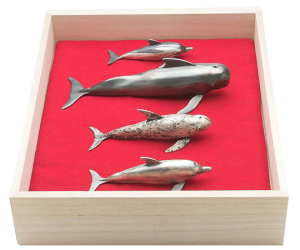 Other four species of dolphins, which are hunted in Japan, are in a box that I had made and lined it with blood red cloth. It is similar to boxes sometimes used for sushi. I hope that nobody wants to eat whales/dolphins and everybody recognises their right to life, liberty and well-being.